Day 22 of the #NurseBlogger challenge! Every body develops a routine in the workplace. Some people do things differently than others. One thing that seems easy to one person, might be difficult for someone else. Once you start to get the hang of your job, your routine starts to kick in and you do the same things each shift. It took me quite a while to find my routine, but I did, and I typically follow it every shift. What are 5 things that I do every shift? 1. Update my patient boards in the morning. This is important so your patient always knows who is part of their care. Usually the patient board says the nurses, techs, and doctors name. It’s a good thing because if the patient loved their care throughout their stay, they can look at the board to be reminded of the names on their care team and give comments or compliments. But it’s bad because if they disliked their care, they could also complain about their care using the names on the patient communication board. But, updating the patient communication board is good for communicating with the patient and basically taking credit for the care you are giving that patient throughout your shift. 2. Actually take time to eat breakfast. As people working in a hospital, especially the ER, we get busy and tend to ignore our bodies needs. That is probably one of the worst things you could do. I understand if you have a critical patient and need to dedicate all your time to making sure the patient doesn’t die, but otherwise, take the time to listen to your body and feed it when it’s hungry. Breakfast is the most important meal of the day. It fuels your brain, wakes you up, and helps you to function better throughout the day! I usually get to work, get report on my patients, make sure they are stable, then I run downstairs to get myself a well balanced breakfast. 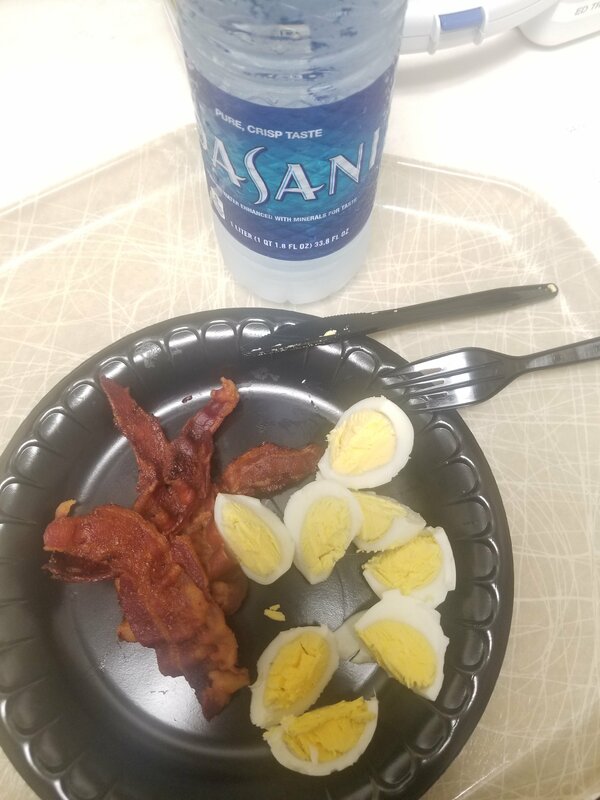 I like to mix up my breakfast every once in a while but typically it consists of a combination of a few of those things. Generally it’s pretty healthy (better than not eating). I also notice that when I eat breakfast, it lasts me until right around lunch time before I get hungry again. This one is also very important. I’m the type of person that kind of has to force water down my throat. I don’t necessarily like drinking water unless I’m really thirsty, or I have to be in the mood for it. That’s not necessarily a good thing because that means I don’t drink enough throughout the day. So, now when I go downstairs to get myself breakfast I get myself a liter bottle of water that I force myself to drink before I drink anything else. Sometimes it takes me 1 hour, sometimes it takes me 12. But it’s always my goal, each shift, to finish my entire liter of water before I drink anything else, like a coffee or pop/soda (yes, I say pop, don’t judge me). I usually pee a lot when I drink a lot of water, which can be inconvenient when you work 12+ hours on a busy unit. But keeping your body hydrated is much needed. 4. Stock up my section. As a tech, one of my most important jobs is to make sure my section is stocked. It is the worst thing when you are in the room of a critical patient that needs something and that something isn’t there because either I or the previous shift did not stock. As a tech, I have to make sure that each of my patient rooms have linens and supplies needed to assess and perform certain tasks on them. 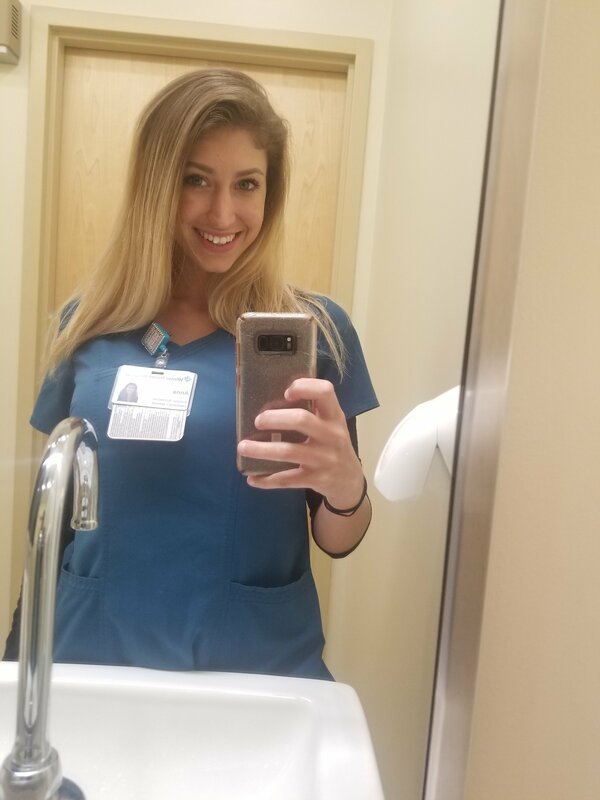 When I get to work at 7 am it is usually pretty slow (hopefully) so I have time to go in each of my patient rooms to make sure that anything we might need for the day is stocked. I work in a place where teamwork is strong. In most instances the nurse and I usually go in each patient’s room together to get tasks done, making it much quicker. I make myself available during every shift so that if anyone needs help with anything, I can go and assist them. I know that when I become a nurse and I need help, I will want someone to be available to help me. I can not expect to get help from anyone if I do not help the people around me now. Working in the ER is fast paced and can be difficult managing many different tasks on many different patients. It is my job to make myself available to my staff so that I can assist and make their jobs easier.